Kawah Putih lake (7.10° S 107.24° E) is one of the two craters which make up Mount Patuha, an andesitic stratovolcano (a "composite" volcano). Mt Patuha is one of numerous volcanoes in Java. 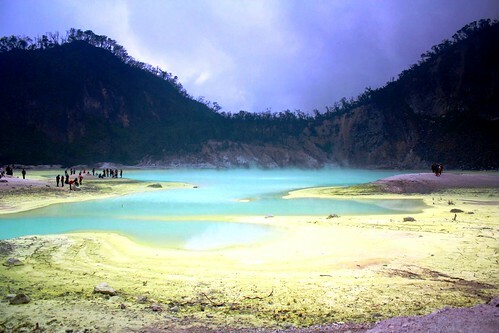 The Kawah Putih site was opened to visitors in 1987. The lake itself is 2,430 meters above sea level so the local climate is often quite chilly (temperatures are frequently around 10 degrees celsius). This makes a brisk change from the humidity of the north Java plain and the capital city of Jakarta. Kawah Putih is a sizeable acid lake which changes colour from bluish to whitish green, or brown, depending on the concentration of sulfur and the temperature. The sand and rocks surrounding the lake have been also washed into whitish colours by the vapours from the lake.